The most compelling bat of last night's Tigers-A's game came in the bottom of the seventh. Oakland had runners on second and third with two outs, and backup catcher Stephen Vogt did his best to make Justin Verlander look mortal. The grueling at-bat lasted ten pitches. Vogt fouled off the first two and had to keep swinging to stay alive. Verlander was at 107 pitches for the night when the at-bat started, but every fastball he threw was recorded at over 96 mph. The threat finally ended with Verlander punching out Vogt with a 98-mph fastball, Verlander's last pitch of the night. Verlander was his usual self, but A's rookie Sonny Gray was somehow better. In Gray's 11th career start, he went further than Verlander, hurling eight shutout innings with nine strikeouts. He only surrendered one hit out to the first five batters in Detroit's lineup; naturally, it was Miguel Cabrera. Gray kept Oakland in the game long enough so that Verlander would have to leave, and when he did, the batters picked at a reliever until he collapsed. Pity to the pitcher who has to pitch against Verlander, but Gray kept up with the Tigers' ace. (Sure, Verlander's had a down season, but he's still Justin Verlander.) 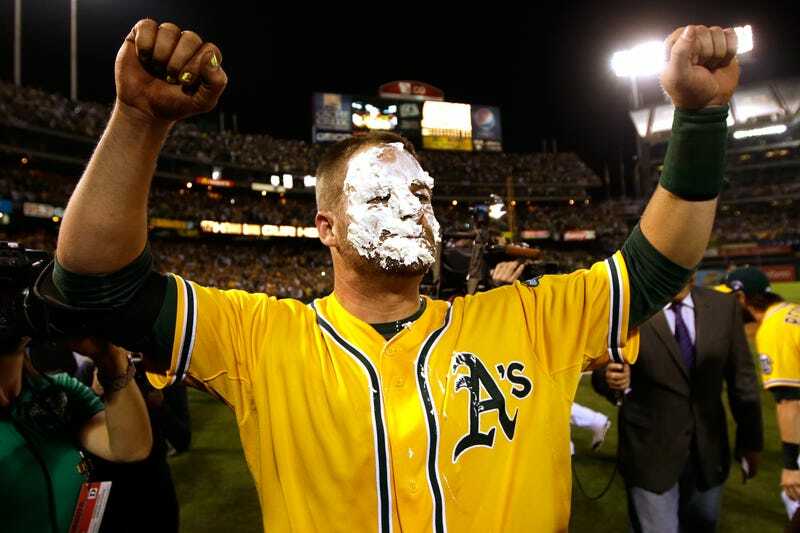 And Vogt—who had a .295 OBP in 135 at-bats this season and didn't get his first MLB hit until his 33rd at-bat—made up for his three strikeouts and notched the walkoff hit against Al Alburquerque Rick Porcello, tying the ALDS at one. It doesn't get easier for Oakland in Game 3. The A's now have to find a way to score on Anibal Sanchez, with a team-leading 2.75 2.57 regular-season ERA and a 2.70 ERA at home. But outlasting Verlander after losing to him twice in last season's ALDS must have felt damn good.